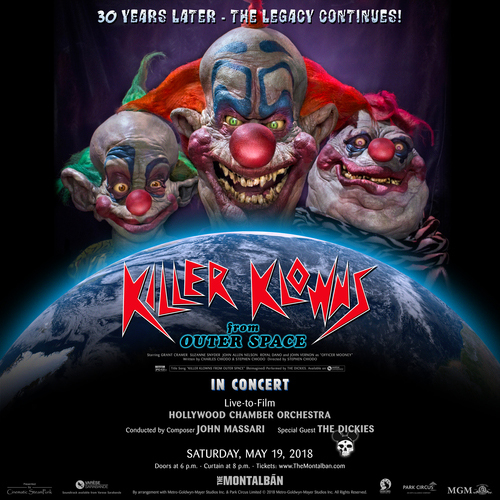 Howlin' Wolf Records: SIX STRINGS: "KILLER KLOWNS FROM OUTER SPACE" 30TH YEAR ANNIVERSARY CELEBRATION! "KILLER KLOWNS FROM OUTER SPACE" 30TH YEAR ANNIVERSARY CELEBRATION! “Clowns can be frightening, bizarre and terrifying. We took that primordial fear and put it in a Sci-Fi movie,” explained composer John Massari. “You have something that should make you happy and laugh, but now it will kill and eat you and… it’s from outer space! Who would have dreamed of this? That’s the craziest idea in the world.” Over time the film has earned generations of fans – many of whom Massari has connected with both through social media and at conventions leading him to create this special celebration of all things Killer Klowns. For the 30th Anniversary, Massari has created a three-ring Sci-Fi/Horror celebration, reuniting an amazing line-up of special guests, including the film’s creators, the Chiodo Brothers, musical guests The Dickies, stars Grant Cramer and Suzanne Snyder. At 6PM, the Kosmic Klown circus celebration will begin with stilt walkers, balloon folding artist Buster Balloon Cadwell, contortionist Bonnie Morgan, plus fortune tellers, strong men and women, magicians, body art, fan arts and crafts, and of course the Killer Klowns. There will be a pre-show Q&A at 7PM featuring Stephen Chiodo (writer/director), Charles Chiodo (writer/art director), Edward Chiodo (writer/producer), Grant Cramer (Mike Tobacco), Suzanne Snyder (Debbie Stone), members of The Dickies, and composer John Massari, moderated by Jim Branscome of Cinematic Void. Varèse Sarabande Records will be releasing a new recording of the soundtrack on CD and LP, available for sale at the concert. The album features the original score performed by members of The Hollywood Chamber Orchestra, with new orchestrations by Massari and Bernhard Eder. The Dickies recorded a BRAND NEW version of the film’s theme song featuring an extra creepy intro followed by their signature pure punk energized sound. Now here is a show, I would love to see... if you are in the neighborhood, just go! MovieScore Media: "MIRIAM CUTLER: FILM MUSIC"
Milan Records: "HEARTS BEAT LOUD"